Do you want to work-out with new YouTube marketing strategies? Is your patience crashed in the journey of exploring your brand on YouTube? 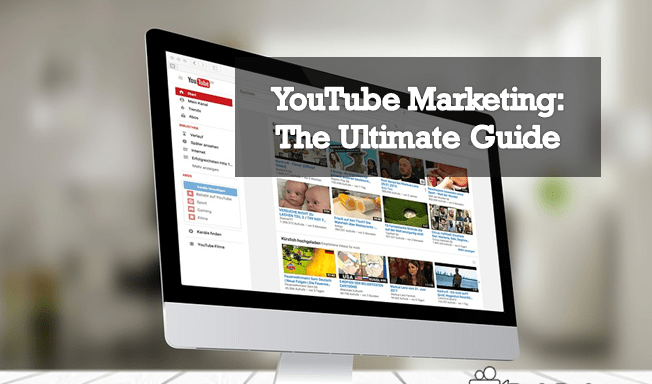 Why don’t you put a full stop for all these queries with ultimate YouTube marketing guide? How to develop video concept idea and implementation? How to Optimize YouTube Videos using Video SEO? How to Create YouTube Custom Thumbnail Design? How to Create SRT Files (Subtitles & Closed Captions) for your Video? Cent percent of the Global market entirely relied on video and the most seeking video platform YouTube is the primary source to feed all the marketers either for offline business or online business. The promotion of brands to disclose either services or products the best fit medium to reach the essential customers from audiences is YouTube. YouTube Marketing can enhance the business branding where you can reach the targeted audiences naturally and quickly within a short period. Cherry-pick the theme of the content that is unique from others. Frame the outlines of the topic that astonishingly delivers the internal content. The title itself should disclose what the content is. Make sure to have the specific length of the video that is more interesting to watch without boring. Always compose the video with the involvement of famous figures that should be eye-catching. The most significant one that everyone should remember while creating the video is a custom thumbnail. The thumbnail should design in an efficient way which can immediately stimulate the audience to go inside the video at a single visit. Now create the video which can make viral vibrations in the YouTube video marketing history. Now you came to know about the YouTube marketing but what are the necessary steps needed to launch the YouTube channel. One can create YouTube channel either personally or for business purpose. These two are most useful to promote your branding or others as an influencer. Here are simple steps to create the YouTube channel easily. Initially, sign in with the Google account have previously. The channel provided actions like making comments, the creation of playlists and the video uploaded to YouTube. Otherwise, you can create the channel if you are the new user of YouTube. After that have a keen eye on details that you mentioned along with the Google account and then create a channel. The branding of the business can elaborate by accessing the branding YouTube channel account. This account also linked up with the Google account. Primarily sign into the YouTube account with your Google account details. Note: You can sign up by using either mobile or desktop. If you have chosen the brand account from the list, then go on to create brand account YouTube channel. If you already have the channel that is associated with the brand account then you are no furthermore allowed create a new one. You can access the existing brand account. Now go on to further step of getting verification by naming your new channel. After that hit on ‘done’ which automatically creates the brand account on YouTube. The channel manager can manage following the instructions that are needed. A video can get much demand when it is being surfed as the top content in the search engine results. What optimization strategies do we need to follow that generates continuous engagement for the channel notably through the search engine? The initial and most significant aiming concept is keyword framing. The keyword plays the vital role to make a video to have the continuous engagement. The universal and most trending keywords on the search engine must be given priority to use at your videos. The titles are the feeding source to a video that clutches the each user to go through the video content. It also outlines the content of the video is. The description appears on the search page along with the video and describes the actual content inside the video. The allocation of titles and description should efficiently do. The tags make your video to blink at the relevant search results of the search engine. Hence add the cards that are most trending and entirely relevant to a particular topic you choose to compose the video. Sketch the most watched and engaging video content that drives all-time traffic for your channel by analyzing analytics. Depending on that strategy create the similar concept with unique content. Try to generate the snackable video content that contains all information about what you want to disclose the audience. Remember that the video should not be the bloodsucking bug of viewers. Add the links of other video content from your channel that can hold the massive traffic for your circuit which can obtain by sharing on social media sharing like Facebook, Twitter, Snapchat, and Instagram. The Thumbnail of the YouTube video is the most significant one that acts as like an icing on the regular cake which makes it look delicious. In such a way it gives the lovely presence to the video on its entry on the online screen. Here are few steps to create the eye-catching thumbnail directly. The characters of the thumbnail must pull the audience to go inside the video. Give preference to use the close-up photos which are most pleasant but not weird. Always follow the specific measures to sketch the size of the image. The size should be chosen that is more compactable on any device. Make sure to have the fine background and it can also be created by using the effective icons to sparkle at the audience. The template of the thumbnail should stimulate the audiences which can give the watchable atmosphere at the channel. Try to introduce the famous places and figures which are most familiar to the audiences. So, that it could act as the foodie to simulate the audiences to know about their most known ones. The use of subtitles and closed captions are the ever trending and most workable concepts to gain more global audiences. The one who doesn’t understand your local language can understand through subtitles either in common language or in their language. Do you know how to add them to your video? Are you thinking too much about it? Just get relaxed. Everything you can find here from pin to pin. After login to your YouTube account hit on video manager. Then go to video then click on edit option to insert the subtitles and captions. Hit on ‘add new subtitles/cc’. Now add the subtitles and captions how you want. These cards and end screens will remind the audiences about the particular action that the creator wants to disclose at them. Initially, log into the YouTube account. Then go to ‘creator studio’ then select the ‘video manager’ where you can find the option ‘video’. Then choose the ‘edit’ option to add the end screen. If the video already has annotations then hide them. Now select the ‘add element’ to add the four categories in which the playlist or video is mandatory. Make adjustments to assign the time and size of the video. Playlist In YouTube allows users to organise your videos according to Name, File Size, favourites, Movie name and Song name. Billions of videos uploaded to YouTube Channel.So, we need to organise our YouTube videos in a Playlist for easily recognised by the search engine. Also, YouTube Playlists arrange channel videos into groups by an artist or by a topic name. YouTube has a setup for a playlist to play videos one by one automatically.The videos Organised in YouTube playlist can increase the high rate of Views, and at the same time, high rate view will lead the high rank in YouTube search list. When you’re naming the Playlist in your YouTube channel keep in mind that Playlist Title should be a focused keyword easily recognised by the YouTube search algorithm. Title of the playlist must be short and descriptive according to the rules of YouTube search Algorithm. YouTube allows users to add maximum 5,000 words as playlist description for more search visibility. It helps the users to understand the nature of the playlist and to rank better in YouTube search Algorithm. Collect all videos of the same category into one group then range your set of playlists. Every company should create a curated video playlist to drive more traffic and for better viewing experience. Playlists increase the watch time of your channel and assertion of your videos will appear in suggested playlists in the search result. You can create playlists of your videos, others videos and the combination of both. some ways we can Market YouTube channel and channel video using social media and other Search Engine optimisations. We should follow some tips to market YouTube channel Videos. Create a Specific Perfect Thumbnail for your videos. Your Video thumbnails can lead high view rate to your Videos for marketing. YouTube all Other Social media websites to market your YouTube Channel. Create accounts on Facebook, Twitter, Blog it and Stumble upon posting your videos on it. Creating Unconventional YouTube channel, be a Brand maker not as a YouTube channel which can be created by every business person. Post unique content on all social media websites to recognise your channel. Use Metadata to market your YouTube Channels. Metadata included with a specific Keyword, Description about the video and Unique title following standards for google search algorithm. Implementing number SEO strategies on Your YouTube channel will lead the high number of Subscribers, subscribers reveal the Marketplace of your YouTube channel. Once completion of the integration of the YouTube Analytics in Your YouTube channel account, start analysing your channel by Videos. YouTube Analytics helps you analyse the performance and engagement from Demographically, different sources and with a keyword search of the YouTube channel videos. Performance reports include the number of View of your video, this is an important matrix get to count the Views from analytics report. If you start analyzing from demographic, the factors included in this are Playback locations, Traffic Sources, and Audience retention. The success of your video depends on counting the number of likes and Dislikes, number of Subscribers and shares on other social media platforms. If you consider the Views from analytics if your view of videos are increasing you are going in right track or creating good videos. But if views count is decreasing or stay constant you should focus on creating better videos. Traffic sources define how people finding your YouTube Videos. According to that traffic, sources include that keyword in promotion strategy. When it comes to YouTube advertising we should follow YouTube marketing Tactics. Video advertising has become more prominent in digital marketing. A number of ways we can launch YouTube Advertising campaigns. One of the best way people choose Google AdWords account to advertise their campaigns. Before start Campaigning ads make sure liking your YouTube Account with Google AdWords account. To add the video just copy paste video URL in the URL box. In-stream ads play the maximum of 30-60 sec video and 2-3 minutes video ads they are called full-length ads. 30-60 sec ads do not have skip option you must give priority to those ads for watching YouTube videos. Long length videos can be skipped after 5 sec. You need not pay for long length videos and the ads with no skip option give a quick link to your Website or a YouTube Channel. When you are searching for YouTube videos it displays on search results with a small yellow ad mark.YouTube In-display ads need little complications which creating videos. YouTube Thumbnail is important in In-Display ads first people will notice the ads with the thumbnail.It should be eye-catchy the Headline and descriptions are more important in In-Display Ads.Use call to action tags in the In-Display ad campaigns. Online spending over amount on ad campaigns daily, spend the total amount for a complete month. Paid searches may cost to high if you spent on a daily basis. So plan for a month with an approximate budget. You can start spending on ad campaigns depending on common factors like demographic location-based, Name, Keyword ReSearch results, Call-to-action, targeting on Groups and targeting on Budget. Branding is the way to create a unique identity for your products and Viewers can get habituated to get back to more types. Brand create an identity in customers to follow. Before going to upload a video to a YouTube channel, we should follow some minimum curtsies while creating the YouTube channel. Create the best channel art for your YouTube channel starting from a logo, images, video thumbnails, channel Description, channel background images and with the appropriate name. Create a watermark to brand your channel videos on the YouTube. A watermark which appears on the bottom right corner of the Videos. Create Channel Trailers that it creates the great impression on the viewer’s mind gets inspired to subscribe your YouTube channel. Featured Content is the great an awareness among the audience to choose your videos playlist and to subscribe your channel. Use Cards to add more user engagement through the audience and is perfect to promote product videos, websites through unique titles, descriptions and call-to-action tabs. YouTube has a vast collection of how to tutorial videos. Most popular How to videos are DIY videos, kitchen Hacks videos, Cooking Videos and finally how to use technology videos. Generally, YouTube Vloggers reveal the insight of passion to create the trend in a community. Vlogs reveal beauty secrets and Makeup styles and more about fashion and Lifestyle to follow the trend. YouTube has a large number of YouTube cooking channel. People usually check mon YouTube how to cook food in various styles. Millions of people watch YouTube videos to learn how to cook various recipes. People always check review videos for technology and gadgets. Most popular product review videos from YouTube are technology reviews and updates. Prank videos are trending now in all countries. Prank videos are of 2-3 minutes long length videos but offer complete fun type so, people habituated to watch Prank videos from different countries. Generally, YouTube videos give more information than reading the book. Educational videos are of various types such as technology videos, Kids Rhymes videos, Mathematical videos and science and technology experimental videos. Entertainment videos are most popular in YouTube channel. YouTube videos like celebrity shows, Music tracks, Video songs, Movies, sports, and News. All International and local TV channels have YouTube channel to update their videos to be followed by people who missed to watch on TV. Take Advantage of the YouTube Video tools uses proper Watermarks, Metadata, Cards for your Videos. Take leverage from Analytics to properly utilize Optimization techniques. Share your content with other and invite cross-posting your content in different websites and blogs to enhance view rate. Consider some paid advertisements even if you can’t offer more. Because paid ads are one of the best practice for YouTube marketing. Spend more time on watching YouTube Videos then only you come to know the competitor’s strategy in YouTube channel Marketing. Promote your post on Social Media Platforms like Facebook, Twitter, and Blogs. Don’t expect Your Video Go videos Viral, create a quality video with unique ideas that video go Viral automatically. Maintain Consistency in your Content to get more audience engagement, Find your Niche where you’re in the market your business. The above is the complete guide to the YouTube Marketing. We make sure that every thing included regarding to YouTube Channel Marketing.